A Raw Diet (Species Appropriate Diet) provides our dogs with all the nutrition they require, due to the abundance of vitamins, minerals, fiber, probiotics and digestive enzymes! Although not all kibble is created equal, much of what is sold greatly lacks in true nutrition, and many of the less expensive brands are loaded with fillers like corn, and meat by-products rather than real meat. Due to high heat during processing, most of the vitamins labelled are rendered useless. Live probiotics are non-existent in kibble. And digestive enzymes aren't available either, since these enzymes only naturally occur in raw, rather than cooked meat. Dogs consuming a Raw Diet get to use their teeth, as often their meals will consist of whole meaty bones. This greatly helps to keep their teeth and gums clean, and aids in digestion since the dog takes more time in eating. A dog eating kibble literally inhales his food. Rarely do they use their teeth, but rather swallow the pieces whole. This does not help digestion, nor does it do anything to clean their gums and teeth. Kibble actually contributes to tartar build-up! When dogs are on a Raw Diet, water consumption lowers since water is naturally occurring in the meat. Bowel movements become much smaller and firmer, as a dog's body only eliminates what it doesn't require. Water consumption is high with a kibble fed dog, as kibble is dry and often contains many harmful preservatives like salt, which only create more thirst. Excessive water consumption is very hard on a dog's kidneys. A Raw Diet actually costs less than many brands of kibble, and will also save you money on vet bills due to your dog's improved health from eating nutritious food! kibble. Dogs are often still hungry after eating kibble, and the natural response from most people is to feed more, compared to dogs feeling satisfied after a Raw meal! These are only some of the many reasons why feeding our dogs a Raw Diet is naturally healthier, not to mention how much happier your dog will be eating real food!!! And as we realize that this is a highly controversial subject, we in no way, mean to offend or insult anyone with their decisions on feeding their dogs. We suggest, however, to research this important matter further. If anyone has questions pertaining to the Raw Diet, please contact us directly by email at info@doggytime.net, and we'd be more than happy to help you! Carmella Barry is a dog behaviourist, specializing in holistic health and nutrition for our canine companions. She grew up in rural southern Quebec where her family provided a sanctuary for feral and wild dogs. In her teens, she began to rescue and rehome dogs as well as begin her studies into canine nutrition and behavioural science. As an adult Carmella has continued her work with dogs in California and Ontario. She has dedicated herself to educating people on animal nutrition and behaviour. Carmella is a staunch advocate against Breed Specific Legislation (BSL) and assists in relocating dogs that have been stigmatized by these laws. 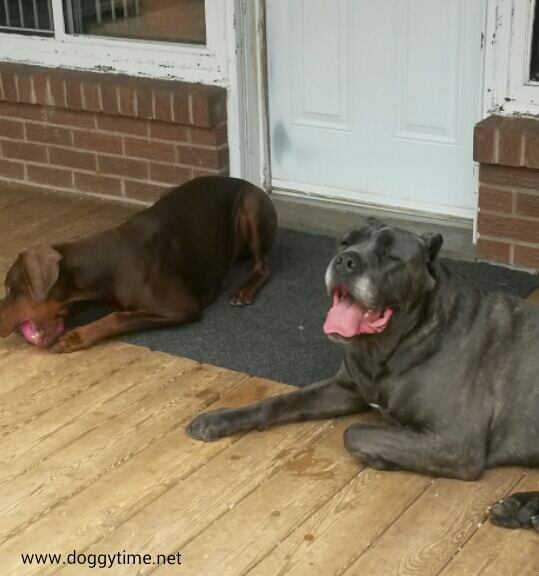 She now resides in Trent Hills Ontario where she owns and operates Doggytime Canine Care and Rescue. Carmella is currently working on her first book and writes a daily article on facebook named DailyDoggyData covering a variety of canine topics. Dogs, being omnivores, can survive on any diet, be it processed kibble, canned food, cooked meals, or a raw diet. To function best, however, we need to cater to the carnivore in our dogs by feeding a species appropriate diet (Raw Diet). This is evident by watching a dog with a bone. Note the dog's teeth and jaw are both designed to tear through flesh and crunch through bone, as opposed to grazing animals that grind their food. A dog's stomach is large and muscular which enables them to consume whole bones quite easily. Due to high acidity in a dog's stomach, bacteria in raw meat does not affect our canine friends, as it would with us. Dogs, compared to humans however, can only produce a small amount of digestive enzymes due to a much smaller pancreas. The solution comes from a raw diet where active enzymes are plentiful. Digestive enzymes can only be found in raw, uncooked meat. - And from the other end, defecation becomes significantly smaller and easier for your dog to pass, since the body absorbs all that is healthy and only rids itself of waste. Our dogs cannot choose what we feed them, so it's up to us to choose wisely. The natural choice should always be a raw diet for the optimum health of our furry family members! A dog's health is much more than just being without disease, it's about our dogs as a whole! A healthy dog is defined as one who is balanced both physically and emotionally, which means they should be happy and agile with a good energy level. Disease does not exist when all parts of the dog's body are working together synergistically and harmoniously! By feeding our dogs a species appropriate diet, giving them plenty of exercise and stimulation, not over vaccinating and doing regular nose to tail inspections, our dogs will live a long, happy and healthy life, the way nature intended!